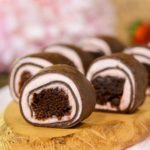 Strawberry Chocolate Brownie Dessert Roll-Ups are bite-size treats made with brownies rolled in crepes coated with strawberry cream cheese. 2 tablespoons unsalted butter approx. Preheat oven to 350 degrees F. Lightly grease an 8-inch square baking pan. Line the pan with parchment paper with at least 1-inch overhang on two sides. Lightly grease parchment paper. Whisk in vanilla and eggs, one at a time, mixing well after each addition. Spread batter evenly in prepared pan. Bake for 30 to 32 minutes, or until a toothpick or cake tester inserted in the center comes out with some moist clumps clinging to it. Cool brownies in the pan on a wire rack. Lift the brownies out of the pan using the parchment paper. Place brownies on a cutting board and slice into squares. Combine eggs, flour, cocoa powder, sugar, and salt in a blender. Blend until mixture is a smooth batter. Scrap down sides of blender as needed to incorporate all ingredients. Heat a 10-inch non-stick crepe pan or skillet over medium heat. Melt a thin slice of butter in the pan and spread melted butter around the pan. Pour 1/4 batter into the pan and quickly lift the pan and tilt it around to form an even coating of batter on the bottom of the pan. Cook until set, about 1 minute. Loosen the edges with a spatula and carefully flip the crepe over. Cook for about 30 seconds. Transfer crepe to a plate. Repeat with the remaining butter and batter. You can layer parchment or wax paper between crepes to keep them from sticking together. Spread a thin layer of strawberry cream cheese on a crepe. Cut brownie into strips and lay the strips near the edge of the crepe. Roll up crepe starting with the brownie edge. Slice into bite-sized pieces. Chill until serving. There will be leftover crepes and brownies. Both can be frozen for later use or enjoyment.